Lavranos House is located in Saint Stephanos N/E on the Greek island of Corfu. This vacation rental property is air-conditioned and sleeps up to 5 people (4 adults and 1 child) with 2 bedrooms, 2 bathrooms along with private swimming pool. The property is walking distance to the beach and restaurants. Ground Floor: The entrance hallway leads into a large living room with open plan kitchen/dining room. A side door leads to the pool terrace. 1st Floor: Upstairs are 2 bedrooms, a double and a twin, both with there own en suite bathroom. A large balcony wraps around the 1st floor bedrooms. Both bedrooms have air conditioning. The living room has sofas, WiFi Internet, DVD player, dining area and ornamental fire place. The private pool is to the rear of the property, offering seclusion and privacy. Beside the pool is a brick barbecue area with outside table for 6 people along with a parasol. 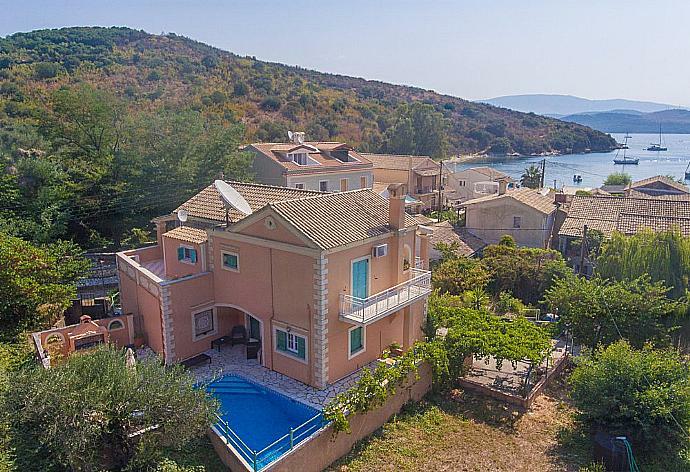 Lovely location and very nice friendly owners, they offered to take me to the local doctor in Kassiopi when I received a nasty bite from the local wildlife. A comfortable stay in a well maintained house, in a great location. All excellent and thank you to Megan for sorting our late check out, very much appreciated. Lavranos House is a beautiful and well maintained property. Situated in a stunning location, only 100 metres from the lovely quayside tavernas and shops. We had a wonderful time, hired a car and explored the island and one day hired a motorboat and went south, visiting a couple of picturesque bays where we swam in the clear waters off the boat. We also took the water taxi to the Agni taverna and had a lovely meal there - very romantic! We met with our lovely hosts, Kristos and Koula who were so welcoming and invited us into their home and plied us with drinks and fresh fruit. Overall a fabulous holiday - we will return!! Lavranos House is a beautiful and comfortable house, ideally situated and has all the facilities you need for an amazing stay. The owners live close by and are extremely friendly and accommodating. Would recommend this highly. We had a wonderful holiday at Lavranos House, it is very well equipped and extremely clean, the cleaner came twice during our one week stay, also changing the linen and towels. Christos and his wife are delightful, he brought us a bottle of wine and some home grown olives one evening, which was a lovely gesture. St Stephanos is beautiful, so peaceful with excellent tavernas. We certainly hope to return. Excellent property. Very well equipped and maintained villa in a good position near the sea front. This was my first visit to both San Stefanos and Corfu. It was wonderful. Our hosts were friendly and welcoming and did all they could to make our stay comfortable. Lavranos House is superb - spacious, well equipped, tastelly decorated... genuine 5 star accommodation. We are already planning to return in 2019. Guests visiting in April should note that only a couple of restaurants were open in San Stefanos and one of the supermarkets. This wasnâ€™t a problem and we got a specially warm welcome from the excellent Galiniâ€™s restaurant staff. But visitors looking for a livelier time should come from June - Sept. Brilliant villa, lovely. Much better than we expected. The gracious and generous hospitality of our hosts who live next door cannot be overrated. Yes - it was exactly as I'd hoped. Perfect location and a wonderful property with every comfort. Absolutely stunning the house the facilities the support from the owners and Agni Travel colleagues.The area was great restaurants, bars, shops and supermarkets - everything. Perfect place to stay and plan to re visit as soon and often as possible. Our 4th visit to Lavranos House and another wonderful holiday we have so many happy memories and look forward to visiting again. Thank you to Christos and Koula for making it a perfect holiday. Excellent. Christos and Koula are marvelous owners/hosts at Lavranos House and helped ensure we had a wonderful holiday. Perfect place to chill relax read drink eat sleep. Exactly what we wanted and needed. Wonderful villa in a great location for those who don't want to drive. The owners were very friendly, helpful and welcoming. Fantastic property. Agios Stefanos NE is a beautiful quiet place to stay with super restaurants, boat hire and shingle beach all within easy walking distance of lavranos house 1 - 2 mins. All in all a brilliant place to visit super accommodation great communication by Agni travel would definitely visit again. Also recommend Agni Travel! This is the third time we have stayed at Lavranos House so I don't think we need to say anymore except of course, thank you! This was a third time at Lavranos House. The villa and pool are beautiful and the standard of cleanliness is excellent. The owners (and lovely neighbours) were as usual very friendly and helpful and nothing was too much trouble for them. They helped to make our holiday so enjoyable and we would like to thank them very much. Lavranos House was fabulous. The couple who maintained and cleaned the house; Christos and Kuala were a lovely couple who couldn't do enough to make your holiday enjoyable. Saint Stephanos is a lovely setting and for the size of the village offered enough choice of tavernas and facilities. We used Sotiris Boat hire and found him to be a very accommodating young man, who took great pride in the service he provided. All in all, the holiday is one of the best we have had. Well done Agni Travel. We had a wonderful week at Lavranos House. The location was excellent close to amenities within a beautiful setting. Everything we needed was close at hand supermarkets restaurants etc so no need to go further afield. The house was super clean and cared for possibly the best standard of cleanliness in any accommodation we have stayed in. The location was peaceful and only a couple of minutes walk to the seafront. Some additional lighting to the downstairs would perhaps make it a little more cosy in the evenings. The facilities were good and the lovely toiletries an added bonus. The service provided by Agni Travel was excellent, nothing was lacking and communication was professional and efficient. We would recommend and will hopefully return. We were blessed with super weather and although the season had not properly started 1 supermarket and 2 restaurants were open. We would highly recommend Lavranos House and will hopefully be returning. I don't think you emphasize enough the superb location of L house - heres a view of the sea from upstairs balcony where there is a table and chairs and the fact that there is always somewhere to sit in the sun or shade due to the wrap round balcony and lovely terrace at the rear. Even the view from the back of the property is beautiful. One of the best ever! Thank you for your efficient and very professional organisation. This included all of the email communication even before our arrival. I would certainly recommend Agni Travel. You couldn't improve it any more. When we had a problem, Christos the owner of the villa was there to help almost immediately. He and his wife Koula were warm and considerate and made it clear that they were available should we need any other help. The transfer to and from the airport was very easy and stress free and all of this contributed to feeling relaxed. I doubt there is a better house in Agios Stefanos so close to the seafront with the tavernas boats and water taxis but with such spacious comfortable accommodation views and good sized pool. The terrace with the pool and barbecue is completely private and not overlooked at all. The owners have part of the lower floor quite separate from the rest of the house but the rest of the lower floor and whole of the upper floor belongs to the holiday villa. The balconies go right round the upper floor so there is always shade to be found and the views in all directions are lovely - either the olive clad hillside behind dotted with cypress trees or across the rooftops of Agios Stefanos to the sea the boats and Albania. And the swallows ... always swallows.The house is well equipped and the double bed even has a mattress enhancer. The owners Christos and Julia Lavranos were very kind and welcoming reassuringly nearby should there be any problems (which there weren't) but aware that some guests enjoy their privacy. 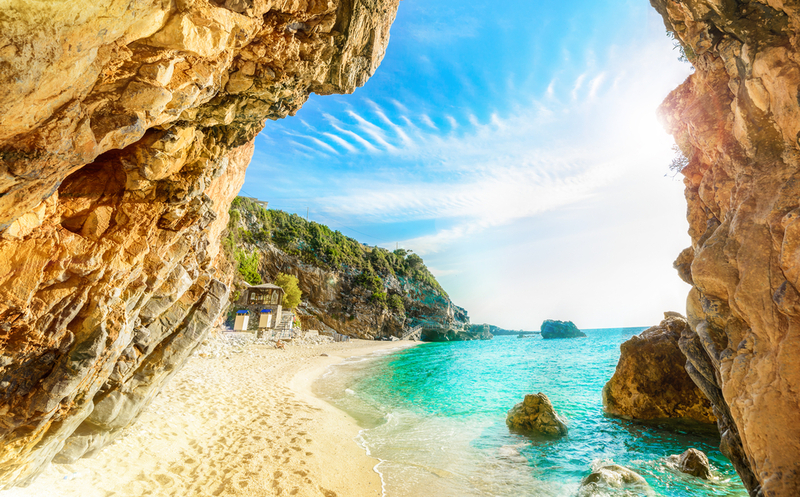 A perfect place to enjoy this very special corner of Corfu. Really enjoyed our stay the house was beautiful very clean and couldn't fault the furnishings and appliances. The owners were lovely and very helpful and gave us wine, olives and pomegranates which were very much appreciated. Lovely village and area with good tavernas we will probably be back. This was our second year at Lavranos House and once again we found the villa and Saint Stephanos to be everything we could have hoped for. The owners are a lovely couple who made every effort to ensure that we had everything we needed. They are a lovely couple and made us feel very welcome. Nothing is too much trouble for them. We hope to return to Lavranos House again in the near future. The description of the villa was completely accurate. Everything was excellent. We all had a lovely holiday in Lavranos House, everything was of a high standard. We enjoyed the pool and really everything in the house, its in a great position in the village. The owner who lives next door was very nice and bought us some home grown olives. Yes we all had a good holiday. Another superb holiday. Agni Travel were as ever most efficient in organising our stay and in their level of support before and during our holiday. We would like to say a special thank you to the owners; our hosts at Lavranos House and now our friends who gave us a very warm welcome on our second visit to their beautiful property and made our stay a very happy one. Thank you. We thoroughly enjoyed our whole week at San Stefano. The village is lovely and the people were very very friendly. We really felt welcome there.The owners of Lavranos House were lovely. They were very friendly and made us feel welcome. The standards of cleanliness were excellent and Lavranos House itself is superb.We would be grateful if you could pass on our thanks to them for helping to make our holiday perfect and in particular for their help and concern when we thought we may have left something in the villa. We cannot praise them too much. Please do pass this on. We absolutely love San Stefanos and the surrounding area. The villa is in an ideal location to be near to the tavernas so no need to drive in the evenings but could be noisy at times.It is our 4th time in the area and hopefully will not be our last. Loved the Villa, was impressed with the service given to us when there was a hick-up in our arrival time. My only complaint is we didnt stay long enough! We would particularly like to thank Christos and his wife for always being on hand for any problems and ensuring that we had a great holiday. We had a wonderful holiday which exceeded our expectations. The organisation through Agni could not be faulted and Christos and Koula were delightful hosts who became our friends.Thank you we hope to holiday with you again next year. A lovely house and very convenient. Mr and Mrs Lavranos were very helpful and charming. It was our first time in st stefanos and we would definitely go back. Villa was perfect for our needs. Lavranos House was booked Yesterday!